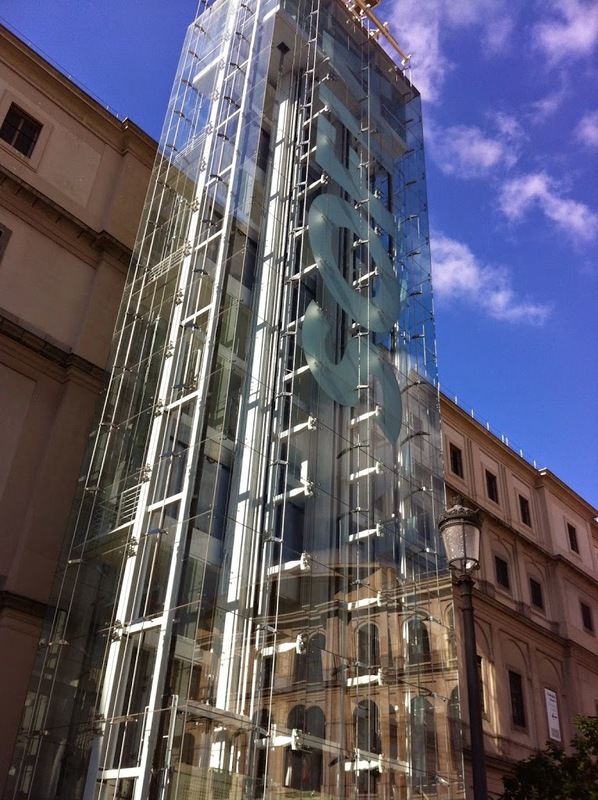 We wanted to see Picasso’s Guernica one more time so we headed out early, after breakfast, to the Museo Reina Sofia. But, alas, it was closed. We sat a bit in the sun, watching other tourists who, like us, didn’t pay attention to the museum hours, react — and then regroup — as they decided what to do next. After a bit we began to walk up Santa Isabel — a happy accident. We passed little bookstores — some markets — and we went in. NOTE TO SELF: When traveling, find the groceries first — before eating out — ahhhhhhhh….so that’s what corazones di lechuga romana are….romaine hearts. Candy store — five kinds of potato chips. We go in. The eleventh pew is closed. There is a crane and the signs that someone is making repairs. Some people are sitting, their eyes closed, their lips moving in prayer. You can hear the workmen…but you cannot see them. Drills and hammers and such. But no words. No one is speaking. The paintings around us, beautiful, have faded. There is, nonetheless, magic here. Something, it seems, in this little Santa Isabel church, needs to be fixed. It is being repaired wordlessly. The part that we don’t see — behind the wall — is being redone. It is being sustained. Someone is working so the magic can last longer. Of course, if you wish, you can give a euro to light an LED candle for a loved one. The bread of San Antonio — alms for the poor. Someone, years ago, built this church. From time to time we need to go into ourselves. From time to time we need repair. Perhaps we will be sitting, wordlessly. There will be a crane there. And guys — fixing stuff. There will be hammers and drills. We cannot see those who will fix us. The paintings will be faded. Us in our worn and torn-ness. And now we are being re-made wordlessly. We walk out into the sunshine, the two of us. We go back out into the world. to be near you is to dream.